Margaret Nomentana makes non-objective paintings and mixed media collages. She began painting seriously in the early 1970's, before moving to Los Angeles in 1974, where she became an early member of the Feminist Studio Workshop at the Women's building. In July of 2012, Nomentana received an MFA in Interdisciplinary Art from Goddard College. She has studied at the Corcoran School of Art, in Washington, D.C., where she received awards in Painting and Design. She spent the summer of 1975 studying at the Tyler School of Art in Rome. In 2009, Nomentana was awarded an artist's residency at the Vermont Studio Center. She holds a Master's degree in Sociology from The New School for Social Research and a Professional Certificate in Interior Design from U.C.L.A. 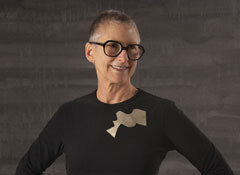 She is a member of the American Society of Interior Designers. Nomentana showcased her work in a one-woman exhibit in 2011 in Brunswick, ME, and in 2007 in Washington, DC. She participated in a juried group exhibition in the fall of 2011 in California. Her paintings are in private collections in New York, California, Maine and across the country. In the mid-1990's, Nomentana moved to the White Mountains of Western Maine where she enjoys the solitude of her studio in the woods. She also maintains an apartment in NYC where she can indulge her culture-vulture proclivities. In addition to an active studio practice, she teaches Drawing, Design and Painting.